The world is home to many deserts but few are more impressive and more important than the Sahara Desert and the Arabian Desert. Both essential to the people who live in and around them, these deserts are far more than just barren land. In this comparison article, we take a look at the key characteristics of both great deserts. The Sahara Desert, known in Arabic as al-kubra, or "The Great Desert", is the largest hot desert in the world. This distinction is made because Antarctica is actually considered a desert–albeit a cold one–due to its low precipitation rates. The Sahara covers an area that stretches from the Red Sea–including sections of the Mediterranean coast–to the edge of the Atlantic Ocean. Towards its south lies the Sahel, which is a region of semi-arid tropical savanna that makes up much of the northern part of central and western Africa. The Arabian Desert is another large desert, although it is considerably smaller than the Sahara. Its boundaries stretch toward Yemen and the Persian Gulf, and Oman, Jordan and Iraq. The Sahara Desert measures more than 9,400,000 square kilometers, and its breadth covers a large portion of Northern Africa. The Sahara is in fact almost as large as Europe or the United States in terms of surface area, and second only to Antarctica, which as explained earlier, is actually classified as a desert due to its extremely low rate of precipitation. Some of the sand dunes in the Sahara Desert can grow to as much as 180 meters in height. The Arabian Desert covers most of the Arabian Peninsula, and it has a surface area of 2,330,000 square kilometers. At the center of the desert is the Rub'al-Khali, which is one of the most expansive continuous sandy areas in the world. The desert has an extremely dry climate, and the temperature ranges from extreme heat to nocturnal freezes. 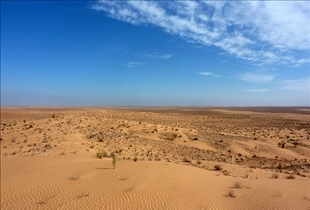 Its landscape is characterized by red dunes and even quicksand. The most prevalent language spoken in the Sahara Desert is Arabic, and it is pretty much this way from its Atlantic to Red Sea borders. The area is populated mostly by Berber people, with a particularly heavy concentration in western Egypt and Morocco. The central Sahara Desert is also populated by Tuareg people. In the Red Sea Hills of southeastern Egypt and eastern Sudan, the Beja people can be found. Among the other languages spoken in the region are Berber and Beja, both of which belong to the Afro-Asiatic group of languages. The Arabian Desert is also home to various peoples, with different languages and cultures present. The most predominant religions are Shi'a and Sunni Islam, and most inhabitants are Arabs. Known in Arabic as "The Great Desert"
The largest hot desert in the world. Which desert is home to more camels? So many desert niqqers, so little time. hello I want to go skiing. Which slope should I visit.